Letter introduction and practice is coordinated with the book Teach Your Child to Read in 100 Easy Lessons. For handwriting practice, the book is not required. While the letters chosen for the handwriting practice are based on the suggested handwriting lessons in the book, the lessons might or might not completely adhere to suggestions in the book because I have added word practice and uppercase letters in some of the lessons. I made the worksheets on this page using a font that has similar style to letters of a particular handwriting program that I can't name because it is trademarked. For more handwriting practice in this style go to: HWT Handwriting Practice Worksheets. Rule Height: The height of the letters is approximately 5/8 inch. The rule has two lines instead of 3 lines. Each letter will have guided practice during the first dozen or so times that the letter appears in the lessons. After that the students should write the letter on their own. 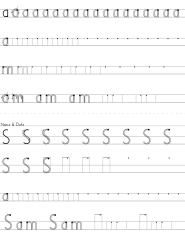 Each printout has two lessons and each lesson will have letter practice for 2 or more letters. Some lessons will contain a word and some lessons will have an uppercase letter.